In the past year, 3.175 billion people worldwide were active internet users. That’s almost half the global population. Yup, half the planet. Active social media users totaled a whopping 2.206 billion just in 2015 and has been rising since. Rapidly. (By 176 million users over 2015 alone, to be exact). What does that mean for you as an artist or creative? More reach. Those 2.206 billion people out there are more accessible than ever; ready to engage in conversation, be amused, entertained, informed, and connected. Now you may not have common grounds to connect with all of those people, but actually getting and staying in touch with them is more effective than ever before. This holds true for generic fans, as well as for influencers with major social reach. If you know how to play your cards right, this is the foundation to building an engaged group of followers. 2.2 What platforms to start with? We’re greatly inspired by traditional marketing and sales, and one of the interesting concepts in that realm is the ‘sales funnel’, which outlines how people are exposed to an offer or brand, converted into leads and then nurtured until they become customers. Once converted into customers, the company’s main challenge becomes extending the customer’s life time, which relates to how long the customer will proceed to make use of a service and/or make repeat purchases. The average spend of a customer, whether in subscription fees or by buying products, contributes to what is known as the customer lifetime value. Companies therefore focus on delivering as much value as possible to customers throughout their customer journey, in an effort to reduce the number of customers that leave the funnel (called churn) and to maximize the customer lifetime value. This happens through a variety of methods, such as diversifying product ranges, extensive customer support, or expansive feature sets for expert users. The sales funnel, in turn, dictates how the company should operate. Once they know the average customer lifetime value, they also know that if they can acquire new customers for anything below that cost, they are making a profit. This supports their ability to scale. If a customer makes them $100 and their cost via advertising and content marketing to acquire one is $80, then technically all they need to do to grow is to spend a lot on those acquisition methods, whilst making sure they have the infrastructure and team in place to support the influx of people. 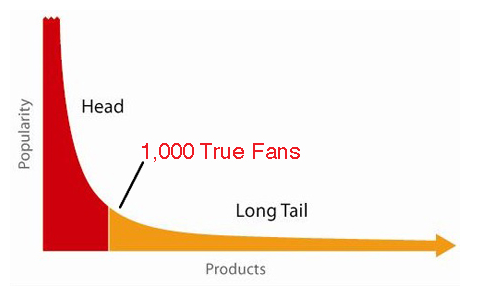 We closely analyzed our label and management divisions and developed the following concept: The Fan Funnel. 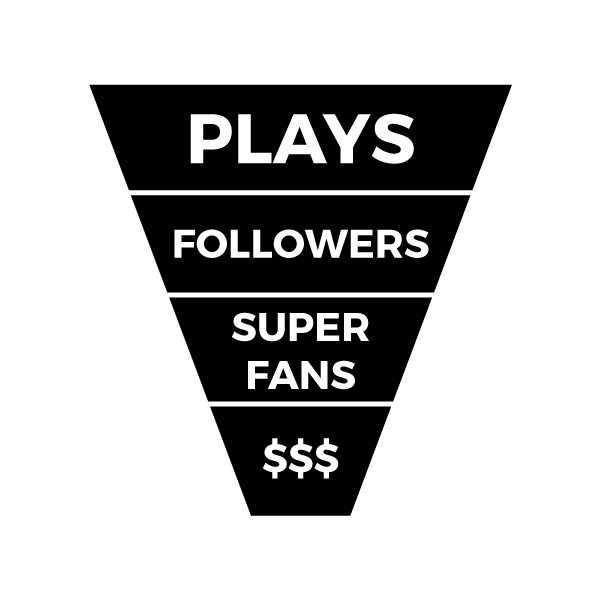 It is the equivalent of the traditional sales funnel, but then made applicable to a (music) fan’s customer journey. We use it to guide our decision-making and strategy for our label and management clients. The journey begins when potential fans (also: leads) are pulled into the funnel via audio/visual media centric social platforms such as SoundCloud, YouTube and Spotify. If they like what they hear or see, they might ‘follow’ or ‘like’ you on one of those platforms, or browse to your other socials, such as Facebook, Twitter or Instagram, potentially subscribing there as well. Learn how to set-up a Follow-To-Download Gate and get more fans! This creates a window of opportunity where you can convince them to become truly engaged, raving superfans. These are the people that care so much about your brand that they would tell their friends about it, come to your show, buy your merch, and stand in line for an hour to get tickets. These people are your primary means to making money and are therefore considered the artist’s holy grail. When fans like, subscribe or follow you, they are creating a window of opportunity. It is their way of giving permission to your future marketing, of saying they like your content enough to want to receive more of it. They aren’t superfans yet, but have granted you permission to convince them to become one. Your unspoken promise to the fan is that you are going to deliver more of the valuable and interesting content that attracted them in the first place. If you deliver, you’ll be able to deeply engage them, converting them into superfans in the process. We call this process nurturing. The window you have to nurture a fan does not last indefinitely. You’re competing with so many others for people’s attention, that the second a fan subscribes, there needs to be a backlog of interesting content immediately accessible across different social platforms, ready for consumption. You also need a mechanism to pull people back into your funnel once they’ve completed their first interaction. You need to have a means to attract their attention one, two or three weeks after they discovered you. Part of this can be achieved by being active across your socials, but the most essential part is to keep publishing more of what attracted them in the first place: quality music. Beyond that, you need to establish how you are going to monetize your superfans. This can be done directly via means such as paid and ad-supported streams, paid downloads and selling merchandise, and indirectly via securing bookings for live performances (being indirect as you are likely getting paid a flat-fee for your performances, instead of a cut on the revenue generated by ticket sales), radio play and such. Actively engaging with fans, responding to comments and messages in a timely matter. Asking for their opinions, involving them in the creation process (nurturing content). Providing an interesting, relevant and unique content-mix on a variety of different social platforms (nurturing content). You see, today, it’s all about capturing people’s attention. Today’s economy is an Attention Economy. If you want to get exposure, it’s no longer about buying billboard space or advertising time on television, because nobody is paying attention there. Gary Vaynerchuk explains this beautifully in this video. Everyone’s clustered to their feeds, scrolling Instagram, Facebook or the next flavor-of-the-month social platform. For you to stand out as an artist, you need to be able to navigate these platforms and deliver relevant and high-quality content crafted specifically for the platform that people are consuming it on. It’s a beautiful opportunity, as unlike ever before, you can involve your fans deeply in your journey as an artist. You can release music and get immediate feedback, announce your releases on Facebook, share your day-to-day on Snapchat, showcase your visual and aesthetic preference on Instagram, use native video on Twitter, Facebook and Instagram to shoot studio sessions and the funny things you appreciate in life. Fans can get to feel like they truly know you, without having met you in person. The success of such a strategy is predicated on a few things; the quality of your music and other content, but also the amount of work and relentlessness with which you are willing to broadcast your life, share your opinions and vision, and your ability to produce a solid mix of content. It’s time to stop overthinking it. Drop the scrutiny. Share. Feed off of the immediate responses. Work with your inspiration. Be spontaneous. Let your personality shine through. Beyond the traditional artist bio, social media gives you the opportunity to brand yourself and communicate who you are. This is instrumental in building familiarity, and eventually, a loyal bond with your audience. It’s a means of building trust. How do you do this? By giving your fans the chance to see who you are as a person. Give them the feeling of being personally involved, of being an insider into your life. Share who you are; not just what you have done. Showcasing your personality is not synonymous to self promotion. Let your audience feel like they’re getting to know you better every time they visit your page or see an update. While music is a big part of what defines you, it’s not the only facet of your identity. Allow fans to see those other facets as well. Create opportunities for them to identify with you as a person. Being more intimate with your fans will make it easier for them to develop a trusted relationship with you. It’s much more enticing to engage with the personable artist than it is with the unreachable grandiose act. Deadmau5 is a great example of this, as he’s always vocal about his opinions and famously raw during his live-streams. In doing so, he’s initiated many Twitter feuds and developed a large reputation of being the industry’s ‘troll’; but he’s established a strong base of engaged fans and haters in the process. The opposite of love is not hate, but indifference. Decide on a clear voice and tone that defines you and implement it throughout all your communications to the world. 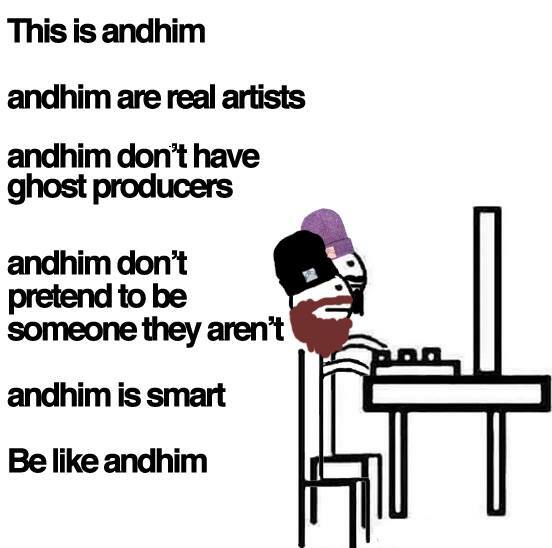 If you’re having trouble, get some inspiration from other artists you think have a similar personality to yours, and pay close attention to how they broadcast. Chances are, they looked up to someone else when they started out too. The fundament of a strong release strategy is that you put out new music on a regular basis. We often advise putting out one track a month, until your audience grows to the point where you have a foundation of fans that will carry your releases further. Keep in mind that music is not the only aspect of your career. You need to be personable and approachable in order to foster relationships and trust. They need to be able to relate. In doing so, you can fill the marketing vacuum that exists in between releases. This is where the content mix comes in: a variety of content published on a particular social media platform that includes different media types (music, images, video, etc) in order to stay interesting to fans. The real goal is to keep your fans’ attention. You’re already halfway there if you refrain from bludgeoning them over the head with the same content (such as only posting when you have a new track out). You want to prevent being one-dimensional. Another aspect is to differentiate your content mix based on the platform that you are using. Fans need to have a reason not just to follow you on Facebook, but also on Instagram, Snapchat or elsewhere. You need to have a unique value proposition for each. Beyond sharing your own material (tracks, future gigs, promo mixes etc. ), try to practice a 2/3rd to 1/3rd division of promotional and personal/inspiring content. “Personal” relates to material that gives fans an insight into your life and who you are as a person. “Inspiring” refers to content that inspires you. Mixes of other artists you really like, industry news that you find important; stuff that intrigues you. The key is to make sure that it’s relevant to your fans. 15 second video previews of your upcoming releases, uploaded as native video to Facebook / Twitter / Instagram. Asking fan’s opinion on what releases they enjoyed the most and why. The options are limitless and you should experiment to find the content mix that fits you and engages your fans best. Mix in and emphasize content that incentivizes fans to interact and reward them when they do. People want to know that their opinions are valued and one of the best ways to do this is by responding to every single comment and message you receive. This will improve the conversion rate of fans to superfans and also sets the foundation for a relationship of reciprocity with your fans. San’s principle approach to social media is being 100% authentic, by ensuring that each platform is a “mirror of his personality”. He uses his channels as platforms for promoting positivity and openness, and his outreach as an opportunity to create a mutual experience involving his audience. When announcing news relating to his music or upcoming performances, San shares with his fans in various ways; from posting a personal picture on Instagram to communicate his excitement to play at an upcoming festival, to posting short studio videos in Snapchat. With every new release, he seizes the opportunity to connect through emotions; the foundational power of music. And besides his own music, San posts about things that inspire him, like music produced by other artists and visuals he enjoys. San maximizes his social presence by being accessible on Facebook, Twitter, Instagram and Snapchat (besides Youtube and Soundcloud) and varying how he employs them. 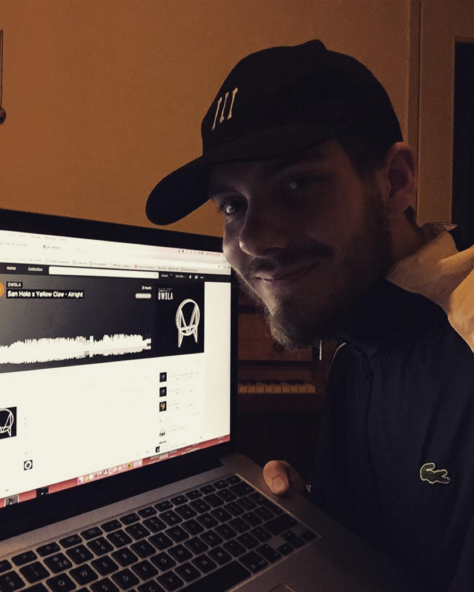 For example, his Facebook page is mainly used for announcements of shows, new music, and for showing support to other artists he appreciates. He uses Twitter to share his thoughts and reflections, uses it to reply to comments and questions directly. On Instagram he keeps it intimate; sharing images that capture his emotions, experiences and things that inspire him. He uses the platform to share video footage as well, but shares images more often, understanding that his fans may benefit more from a post they can access in shorter time. On the other hand, his Snapchat is mostly used to capture things he finds funny as well as moments in the studio and on the road. San’s provides value to his fans through his socials by actively being open and personable, whilst paying close attention to their experience and the connection he builds with them. By showcasing his multi-faceted character, interests and personal life, he gives them a reason to follow him on more than just one platform. Consistency is the cornerstone of a successful release and marketing strategy. As it’s all about capturing your fans’ attention, you need to be diligent in doing things that will expose them to your brand. That way you can stay top of mind. You want to create an expectancy loop, where fans navigate to your socials in the hopes of finding new content to consume. Creating that habitual pattern takes time and diligence. On the musical side, this means releasing regularly. The life-span of music today is shorter than ever, as the supply has never been this big (producing music is solely a torrent of Ableton and a few hours of YouTube torrents away). That means that it’s easy to get snowed under. As said, we advise putting out a new track at least once a month, especially in the early stages of your career. This will not only push you to people’s feeds on SoundCloud / YouTube, but also creates the opportunity to talk about your music on other socials. In order to keep up with that quantity of releases, you’ll need to cultivate a creative habit. Our friend Sam Matla of EDM Prod has a great podcast episode about this topic. James Clear is a great resource too, particularly his post about the physics of productivity. From our own experience, our most successful management clients allocate a set number of hours to music production every day (between 5-10) which allows them to always stay in the habit of creating. Not everything that is created during that period is great, but their output is large enough to be able to separate the gems from the lesser tracks. Their time is then focused on refining the ones with the most potential. Writing this regularly also prevents writer’s block, as the focus shifts from ‘creating your best work’ to simply ‘creating’. When you’re not putting out music, your content mix across your different social channels is what will fill up the vacuum. There, the same laws apply – there’s tremendous competition on platforms such as Facebook, Twitter and Instagram, so only by providing consistent and unique content are you going to stand out. We recommend that you develop a marketing schedule, in which you categorize the platforms you’ll be using, the types of content you’ll be sharing, as well as posting frequency and times. This will allow you to stay organized. We’ve created a framework that you can use, which you can download below. In terms of finding the time to schedule all these posts, we advise scheduling two weekly slots of 30 minutes to map out your content and schedule them. Recommendations for scheduling tools can be found at the end of this article. Once you’ve sharpened the so-called fan-conversion saw, by releasing consistently and developing a killer social media strategy, you can expect to see your fan base grow at a compounding rate. Why? Because superfans will help you spread the word. They are your #1 endorsers, sharing your new releases, liking and engaging with your posts. The inertia of going from zero to a thousand followers is much harder to get through than going from a thousand to five thousand, simply because you’ll have a foundation of people assisting you in the process. The concept of a superfan comes from Kevin Kelly, the founder of Wired magazine. In his amazing article 1000 True Fans he explains that in a world where creators face competition at an increasing rate, consumers have more options than ever. This abundance of choice in the market is referred to as the long tail. For music, this implies that the top stars capture the majority of the market (and the related revenues), however also that there is a significant portion of the market consisting of all kinds of smaller niches (read: genres). Kelly argues that for artists and creatives to survive in this economy, they just have to cultivate a core audience of roughly 1000 true fans (read: superfans). That’s all they need to make a decent living. 100.000 plays > 500 followers (0,5% conversion rate) > 50 superfans (10% conversion – which is conservative). Divide 1.000 superfans by 50 and you’ll see you need roughly 20 releases with 100.000 plays in order to cultivate a core audience of 1.000 superfans. And that doesn’t take into account the compounding effect of having an actual fan base that will engage with new followers and help spread the word. In other words, if you can gather roughly 2.000.000 plays, you’ll be at the starting point of making a living from your music. Sounds about right to us, as these are numbers of a large enough magnitude that you can leverage them into a label deal, finding a manager and booking agent. Of course, once you read this level of exposure, your work is by no means done. A fanbase should be continuously engaged with and nurtured. Keep meeting support with support; because if you just stop there, those 1000 True Fans will hit the road in far less time than it took them to create that bond with you in the first place. You should strive to become a style leader by advocating a particular style in music and aesthetics. Through doing so, you can train your followers to associate you with a particular sound, look, way of communicating and set of beliefs. The visual aspect can be achieved by using the same style throughout your socials and releases (something we advise all our management clients). Other artists choose to also embody a particular ideology. Moby for example is reputed for being a vegan and actively shares his beliefs on the topic. This a strong way to build a brand. 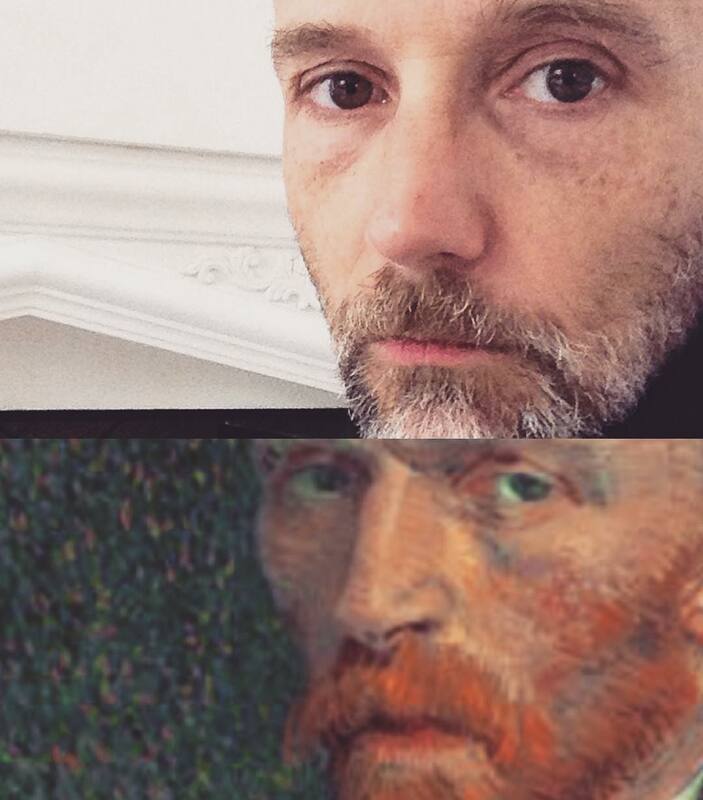 Take a look at Moby’s Facebook page: while he often posts visual content relating to his music or throwbacks to old funny pictures, his activity greatly revolves around animal rights activism and environmental issues that are important to him. The responses to his posts are constant, engaging his followers in a conversation not just with him, but with each other. 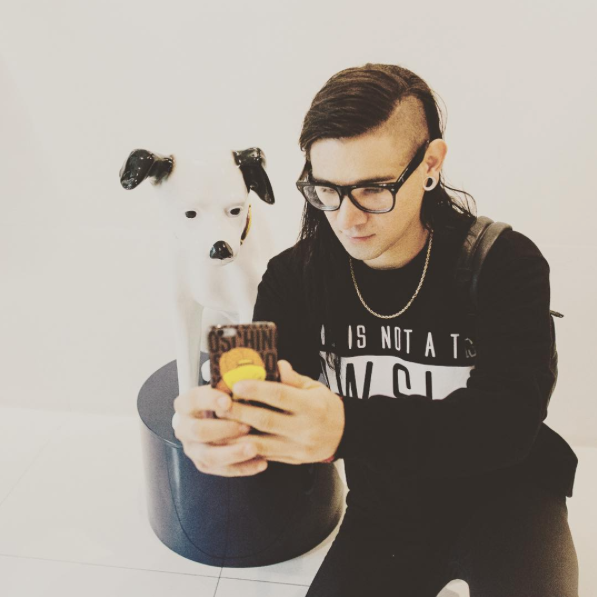 A quick examination of Skrillex’s approach to content marketing can provide some insight into playing those cards right from the offset. Skrillex undoubtedly has a massive social media following, and he doesn’t spend a penny on his marketing. His approach is authentic: he doesn’t just self-promote, but shares things that inspire him like the music of others, articles, or amusing clips. He’s consistent; always sharing content, blog posts and making sure to maintain the connection with his fans. He’s mastered give and take: by consistently sharing free music, he encourages fans who may not be able to purchase his products to still be involved in the experience, and share it with their friends. Berlin based duo Andhim rock their socials by being consistent with their visuals and tone, which is heavily grounded in humor and eccentric creativity. They consistently post videos on their page, including not only performances, but also their daily activities, always integrating that defining humor that works so well for them. Playing into viral trends and twisting them around in a witty way keeps them active and engaged with their followers, ensuring an impressive volume of shares. What platforms to start with? There’s really no right or wrong answer here. We recommend artists to at least have all their musical content up on SoundCloud and YouTube (rendering videos with their music and uploading it to their YT channel), whilst working with the fundamental socials such as Facebook and Twitter to interact with fans further down the funnel. Once you have mastered these, it’s time to branch out and add other socials to the mix. The key is to make sure you can guarantee a consistent flow of content on every platform you’re on, so make sure not to spread yourself too thin. Facebook reaches the most general crowd and is the leading social platform for connecting with fans, advertising and promoting. It’s also the platform with the widest age demographic, with 18-24 year olds leading at 46% and 25-34 year olds at 26% of active users and a shocking 0.5 million users added every day. Facebook is your go-to artist page, and the first place you will be searched if someone likes your music on Soundcloud or Youtube. Twitter is great for setting yourself apart as an opinion leader, allowing direct conversations with your followers, interacting with your fans, and sharing quotes of others. Just make sure your opinions are politically correct, provide value and are worth sharing; don’t be another Ten Walls fiasco. Twitter can complement your social mix by adding a less scrutinized, more personal and opinion oriented platform. It’s probably the easiest platform to engage with followers on. Similar to Instagram, Twitter can complement your mix with more personable and immediate content. 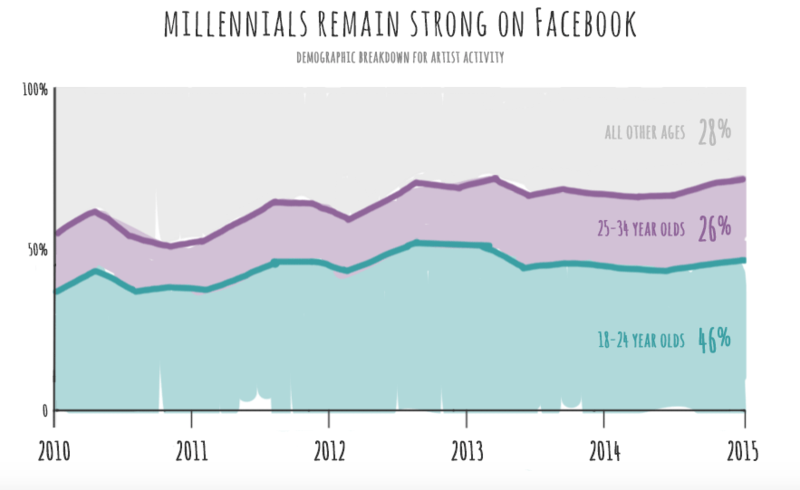 Instagram is more popular within the 18-20 age demographic and is great for communicating visually. The platform has been growing at absurd speed , reaching 400 million monthly users in 2015. Instagram is a powerful accessory to complement your social mix; most followers will look to follow you once they’ve established a connection with you via your music channels and Facebook. With 100 million active users in the past year, Snapchat is great tool for telling a story in the form of fun, bite-size content. It’s the most raw of the mentioned socials, as there’s hardly any features that allow you to ‘sensor yourself’. This makes the interactions very genuine and allows for real sneak-peaks into your life. And because ‘stories’, daily collections of snapped videos and images, are only stored for 24 hours, you can post often and carelessly. Now that you understand our framework for getting more fans and followers, it’s time to put all this information into practice. Make sure all your music is on SoundCloud and YouTube. Also get set up on Facebook and Twitter. Use our marketing schedule to set this up. Make sure to have a unique selling point for each platform. Fill in our marketing schedule so that you have a strategy for maximizing the returns from the socials you’re on. Each of your socials should have links to all your other socials. Determine your tone of voice and make sure to apply throughout all platforms. From your track artwork, to your Facebook banner, to the style of photography posted, make sure they’re in line with a specific style that defines your brand. use tools such as Hootsuite / Sprout Social / Latergram to schedule ahead for Facebook / Twitter / Instagram. Schedule 10 minutes every day to interact with any comments / mentions / links on all your platforms. Once you’ve mastered your content output on the foundational socials, consider branching out to Instagram, Snapchat and potential other platforms. Beyond your Soundcloud and Youtube channels, make sure you’re accessible to your followers on Facebook. Once you’ve built a solid following and a consistent content mix, consider branching out to other platforms. Producers: reach this extremely detailed article on how to become a successful producer, by my friend Sam Matla. Remember, all these social strategies are only effective when supported by consistently releasing amazing music. Focus on that first, then begin releasing only when you have your social game in check. You’ll start getting more fans in no time. In the coming months you can expect 101 articles with best practices on all the discussed social platforms. This article is the beginning of a series which will span audience building across the full online spectrum and if you haven’t already, be sure to grab a free marketing schedule template below. Also, we’d love to have your feedback! What’s your biggest takeaway from this article? Is there anything that has been holding you back? straight into your inbox - sign up below!